Huntington Avenue Grounds, as well as the nearby Boston Opera House, were major driving factors for the 39/E's ridership in their times. To provide background, Huntington Avenue Grounds was the home of the Boston Red Sox prior to their move to Fenway Park in 1912, after which the the Grounds were demolished. Boston Opera House was a major Boston opera venue which was demolished in 1958. The site of the House is currently occupied by Northeastern University's Speare Hall, and the street to the right of the Hall is called Opera Place in memory of the House. Huntington Avenue Grounds around 1911. In the bottom left of the photo are visible the streetcar tracks in the Huntington Avenue Median for the 39/E. Up ahead is the South End, and to the right is Roxbury. The steam that can be seen in the distance is from the NY, NH & H Railroad's Boston and Providence Division's repair shops, which were located behind the ballpark, and the railroad embankment that later gave way to the Southwest Corridor. 1908 Bromley map showing Huntington Avenue Grounds on Huntington Avenue. To the left is Forsyth Street (then called Rogers Avenue), and to the right is Gainsborough Street. The ballpark occupied frontage on Huntington Avenue roughly between Forsyth Street and Northeastern University's Krentzman Quadrangle. 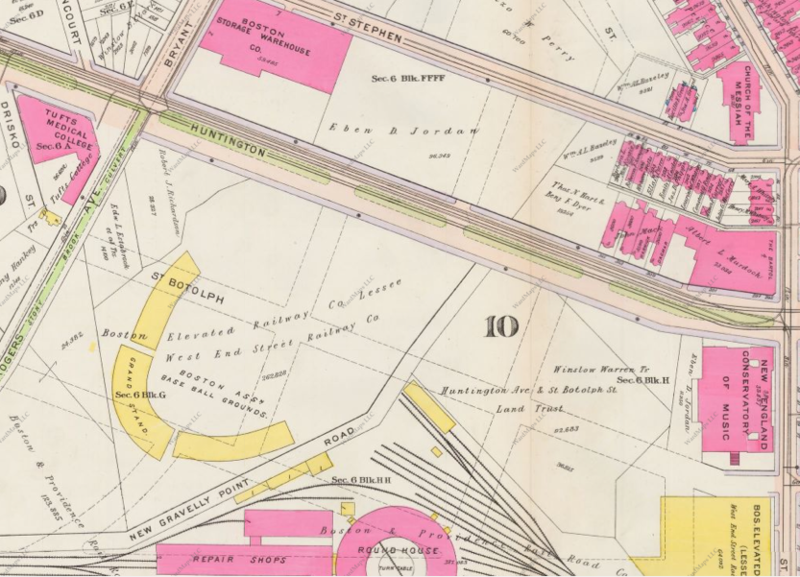 Note that the land on which the ballpark stood was owned by BERy; this parcel was most likely bought by the West End Street Railway and never developed, though it may have once housed a horsecar stable. The building on the bottom right corner on Gainsborough Street also marked as owned by BERy was most likely a stable, and later a carbarn. Map courtesy Ward Maps. Type 5 BERy streetcars parked on the middle track near Northeastern University awaiting riders from the Boston Opera House—the ornate building in the center of the photograph with the triple white columns. Image copyright Bill Volkmer Collection. 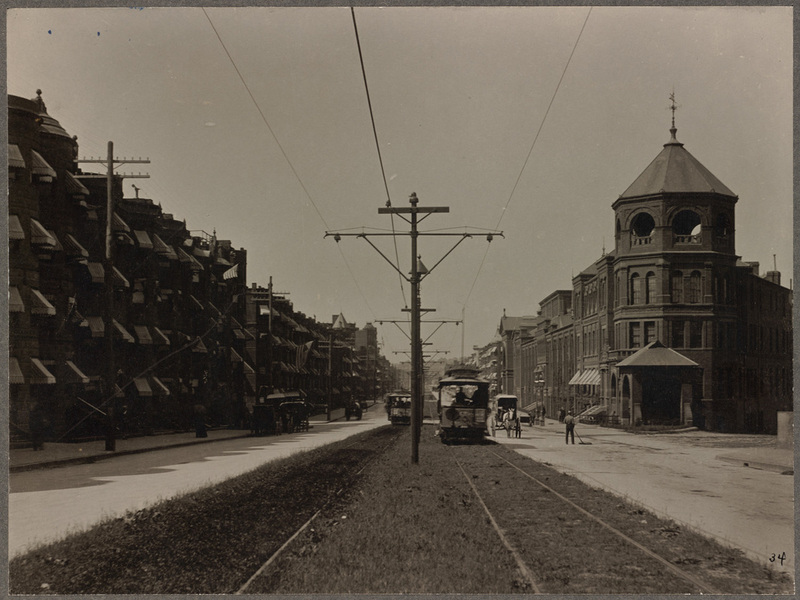 In order to handle the increased traffic from Huntington Avenue Grounds and Boston Opera House, which opened in 1901 and 1909, respectively, the Boston Elevated Railway (BERy) built a special third track alongside the Huntington Avenue Median to store additional streetcars. Originally, the third track diverted off of the median into eastbound Huntington Avenue traffic, allowing subway-bound streetcars to pass stored streetcars which would be stored on the center track, the track subway-bound 39/E streetcars would normally use. Today, the third track is still used, albeit with a different configuration—now that the Huntington Avenue Median has been sufficiently widened to separate the third track from traffic, stored streetcars sit on the third track while passing streetcars continue along the center track as they would normally. The third track sees less use today than it did with Huntington Avenue Grounds and Boston Opera House ridership, though it still sees use to store out-of-service streetcars during the day. Originally, the third track ran all the way to Gainsborough Street. Likewise, the streetcar right-of-way in the center of Huntington Avenue once ran all the way to Copley Square, merging with traffic roughly in front of the Boston Public Library's frontage on Huntington Avenue shortly after passing Exeter Street and the present frontage of the Prudential Center. Looking southwest down Huntington Avenue by West Newton Street, just by where Prudential Station on the E Line is located today. 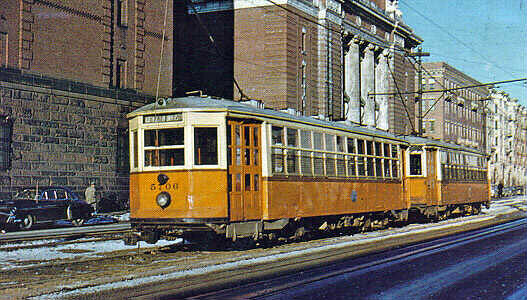 As you can see, the streetcar right-of-way on Huntington Avenue once continued further than Northeastern University. To the right of the photo is the Mechanics Building, a grand convention center razed in 1959 to make way for the Prudential Center. Accordingly, the Station was formerly called Mechanics. However, once the E Line began to exhaust its infrastructure, changes were made to the E Line's right-of-way that necessitated the shortening of the third track from Gainsborough Street to its present terminus at Forsyth Street. As the automobile grew in popularity, the Copley Square route grew increasingly congested with traffic. To solve this problem, the Boston Elevated Railway constructed the Huntington Avenue Subway. Exclusive to 39/E trolleys, the Huntington Avenue Subway opened in 1941 to carry 39/E trolleys underground from the Huntington Avenue right-of-way at Northeastern University to the Subway. 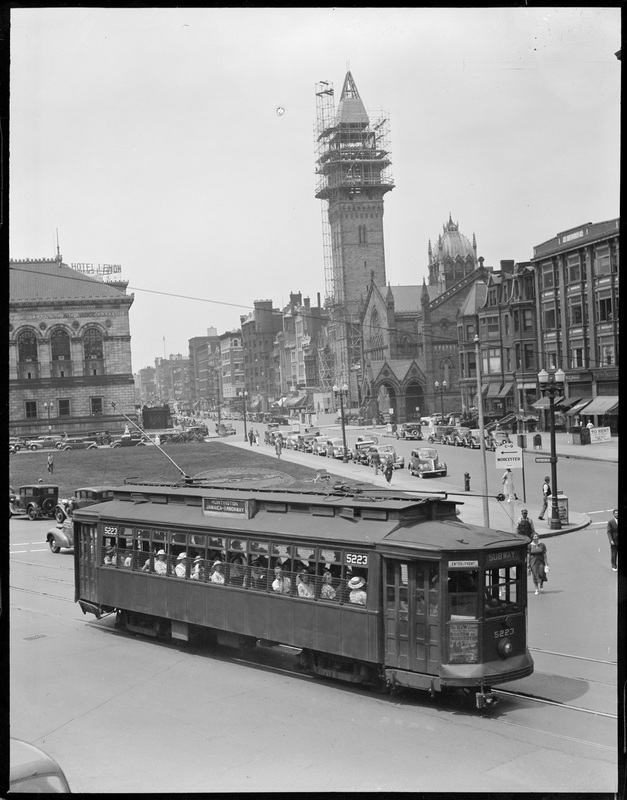 39/E trolleys now travelled under Huntington Avenue, stopping at two exclusive 39/E subway stations in the Huntington Avenue Subway, then turned left underground onto Exeter Street to join the main subway just before Copley Square and stop at Copley Station. Since the 39/E line was the last line to use the Boylston Street Portal, the opening of the Huntington Avenue Subway prompted the closure of the old Portal and the end of street-running streetcar service through Copley Square and downtown. It is important to note that the subway extension was left hollow, which proved to be a problem when the Type 7 Kinki-Sharyo LRVs (Light Rail Vehicles) entered service on the Green Line in 1987. Type 7s are very heavy streetcars, so heavy that they could have caused the subway incline over the hollow extension provision, the tracks of which were only supported by wooden planks, to cave in. Additionally, since the Type 7s are articulated, more repairs had to be done to some of the E Line's street-running tracks to prevent derailments, resulting in a temporary closure to refurbish the entire surface E Line (more on the "temporary" suspension of E Line service in "What Happened to the Arborway Line?"). The first work that was done entailed filling in the hollow subway incline, which was complete by 1987, allowing Type 7s to pass over it. Further changes came to the 39/E Line when the new Heath Street Loop was constructed, prompting the creation of a new short-turn line, the 57. The 57 ran along the 39/E route but just didn't continue past Heath Street to the Arborway. Today's E Line is unique in that it is the only street-running streetcar line that remains in Boston. A setup that was once commonplace, street-running operations have become this rare in Boston due to the advent of the automobile among other reasons. The E Line would only run until the end of its right-of-way at Brigham Circle if it wasn't for the VA Hospital by Heath Street, many of whose patrons need public transportation to get around. In all of these views of the E Line, note how the cars drive in the same lane as the streetcars, and how the streetcar tracks are placed in the street within traffic lanes.